Evidence that the blockchain is creating winners in the new economy abound, but one startup that is winning big on Bitcoin’s surge is the San Francisco digital asset broker, Coinbase. 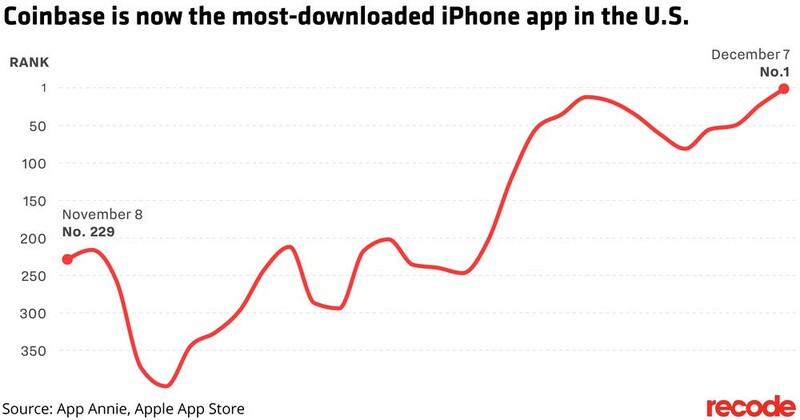 And oh yeah, Coinbase is now the #1 iPhone app on Apple’s US App Store. Struggling to handle Bitcoin demand, no problem. 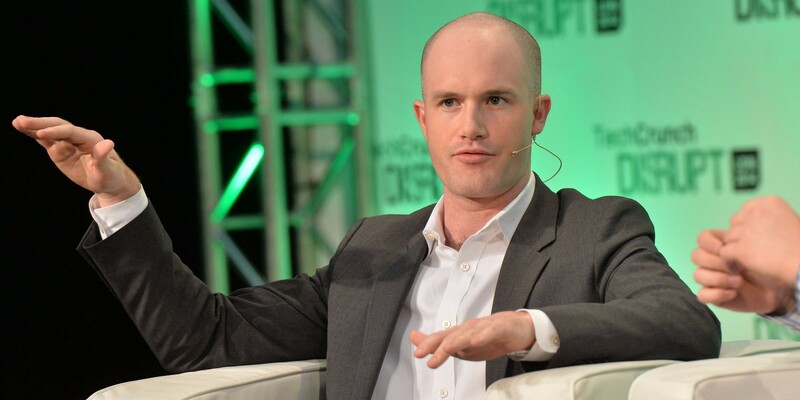 Coinbase is a cinderella story if there was one, and inspite of growing competitors and foreign cryptocurrency exchanges setting up shop in the U.S., Coinbase is nearly synonymous with Bitcoin now, and that’s the kind of name brand recognition that will make this startup a huge success. Coinbase, is now valued at around $1.6-billion and the ultimate stop for converting fiat into crypto. With Bitcoin futures trading starting Monday, the week before has been everything and eventful. Bitcoin’s price is after all anywhere form $15k to $18k USD depending on where on the planet you are. Coinbase has been thriving, as the Crypto Singularity has hit the mainstream and blockchain continues to be one of the most talked about technologies. For example, Australia’s Stock Exchange (ASX) will become the first to go on the blockchain. In Venezuela, amid turmoil, they have turned to an oil-backed cryptocurrency which they call the Petro. The world is changing faster than you can say “Bitcoin”, and for Americans, Coinbase is front and center, at the VERY epicenter of the movement. Imagine it though, being number one on the Apple app store, being its top app and surpassing the likes of YouTube, Facebook, and Instagram. That’s like what Pokemon Go did to us a while back — but cryptocurrencies isn’t simply a silly game, and it isn’t just a fad that’s going away. ICOs have exploded and Crypto Futures seem inevitable as faster, more secure and more ideal blockchain and cryptocurrencies come into being, as dozens of them gain in value following in Bitcoin’s footsteps. What happens though when a crypto asset jumps 20% in 24 hours? Consumers want in. Even though a small minority of Americans will ever hold Bitcoin, the population movement is impressive with a hoard of traffic on Reddit, Facebook groups popping up and articles on the web. Heck, Coinbase even has its own subreddit. The Bitcoin movement is not just forcing the hand of central banks and regulators, but of how we relate and view money in the first place, as a civilization. Coinbase and its sister competitor cryptocurrency exchanges are even shutting down due to the high Bitcoin demand, yet that’s not stopping them. Hire more engineers and customer service staff, try and keep up. Coinbase recorded over 100,000 new users on two separate single days in early November. Coinbase has added more than a million users in the month of November alone, according to data provided by Atlanta Digital Currency Fund partner Alistair Milne. This is only the start for crypto and blockchain and Coinbase has a bright future no doubt in front of itself. It’s actually pretty insane that an app can race to the top of the App Store despite not actually functioning for many users that very day. How does that even work? Word of mouth, mass hysteria, something else? The high ratings of the Coinbase app are also a positive signal that inspite of outages and Bitcoin demand through the roof, they are still doing a solid job to cater to consumers. In 2018, we’re entering an age of Crypto Futures and Cryptocurrency Exchanges, and the world better get ready. If you don’t have an iPhone, that’s okay try their app on Android. Coinbase also employ the peer-to-peer and referral motives to appeal to the Venmo culture of peer to peer ubiquity. It’s one of the lost key points to the future of blockchain. The Middleman is taking out of the equation. With Coinbase you can send bitcoin to Friends of Digital Currency or anyone else in the world. Because Friends of Digital Currency referred you, when you sign up and buy or sell $100 of bitcoin or more, you’ll both earn $10 of free bitcoin! Just 4 years ago Apple had actually removed Coinbase from its App Store less than just a month after launch. In 2017, this isn’t the same Coinbase, and it isn’t the same world. The Crypto Singularity will change how central banks work, add blockchain channels, fuel cryptocurrencies, ICOs and how we do innovation, make decisions via consensus that’s decentralized and create thousands if not millions of jobs. Once a little startup, Coinbase now serves 32 counties and has over 13 million registered users. It’s great to see Coinbase grow, because this is the kind of startup that the world needs. Blockchain is showing the kind of momentum as to break into the exponential tech age which we’ll soon be entering, crypto knows the 4th industrial revolution.